Above and below satellite images of the Wilkins Ice Shelf in the West Antarctic Peninsula where a huge 160-square-mile-chunk of ice disintegrated between February 28 and March 8, 2008. The ice section that broke away measured 25-miles-long (41 kilometers) by 1.5-miles-wide (2.5 kilometers). All that's holding back the rest of the Wilkins Ice Shelf is a narrow band of ice, which might also give way in the near future. Image courtesy NSIDC. 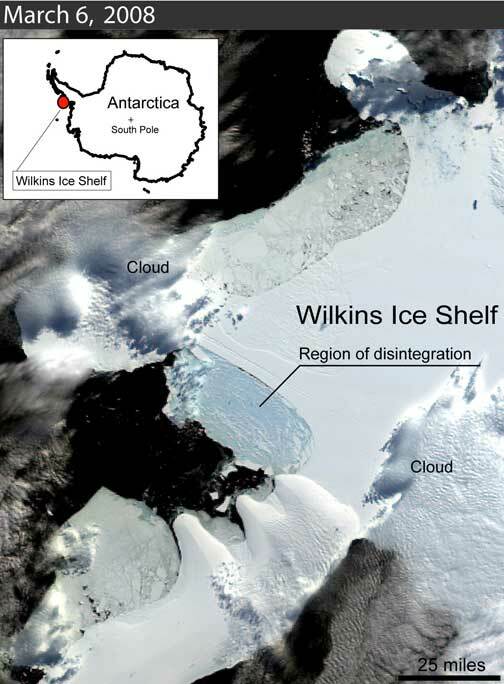 Left: Red rectangle is blown up on right to show the large chunks in the disintegrated mass of Wilkins Ice Shelf the size of Northern Ireland that broke off between February 28, and March 8, 2008. Image courtesy NSIDC. March 27, 2008 Boulder, Colorado - In West Antarctica on March 8, 2008, at the Wilkins Ice Shelf which floats on the Pacific Ocean not far from the southern tip of South America, a slab of ice as large as Northern Ireland broke off. The 160-square-mile ice chunk had been there for perhaps 1,500 years. But between February 28 and March 8, 2008, NASA’s Earth Observing System Aqua and Terra satellites photographed the Wilkins’ disintegration.